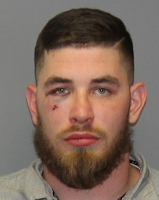 ELLICOTTVILLE -- A 25-year-old Salamanca man is facing assault charges following a shooting Saturday night. According to New York State Police, at 9:34 p.m. Saturday, Troopers responded to the corner of Monroe and Washington streets for a possible shooting. Further investigation revealed that Damien M. Marvin and a 41-year-old male had an altercation in a nearby bar. Both parties exited the bar and the altercation continued outside. During the altercation, Marvin shot one round in the abdomen area of the 41-year-old victim with a legally possessed Glock. Marvin remained on scene and surrendered to Troopers with out incident. The victim was taken to Erie County Medical Center for injuries and is in critical condition. Marvin was arrested and processed at SP Machias and then remanded to Cattaraugus County Jail on $50,000/100,000 bail following arraignment. Cattaraugus County Sheriff’s Office, Ellicottville Police Department, NYSP Major Crimes, Forensic Investigation Unit assisted in this investigation. This is still an ongoing criminal investigation.